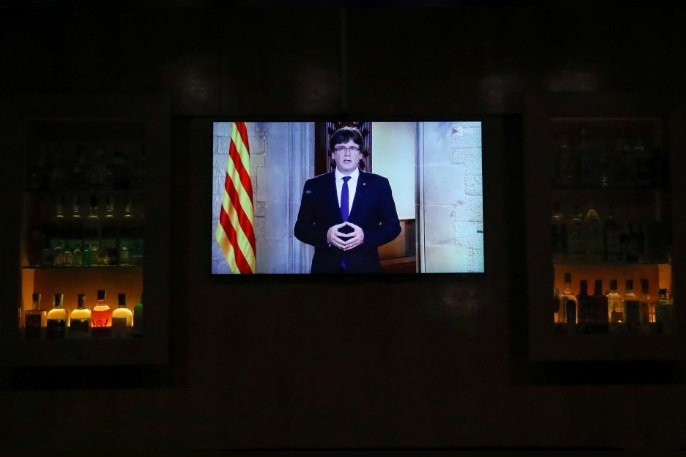 Catalan President Carles Puigdemont is seen on a TV screen at a bar during a televised statement in Barcelona, Spain, October 4, 2017. MADRID - The leader of Catalonia, Carles Puigdemont, said he was not afraid of being arrested for organizing a banned referendum on the region’s independence from Spain, which went ahead on Sunday despite Madrid using force to try to stop people voting. Spanish riot police used truncheons and rubber bullets on voters, drawing worldwide criticism and tipping Spain into its biggest constitutional crisis in decades. Puigdemont’s government is to ask the regional parliament on Monday to declare independence, after his officials released preliminary referendum results showing 90 percent support in favor of breaking away. Turnout was only about 43 percent as Catalans who favor remaining part of Spain mainly boycotted the ballot. “Personally, I am not afraid of that,” Puigdemont said in an interview in the German daily Bild, published on Thursday, when asked about his possible arrest. Puigdemont has said the referendum proved the will of the people was to leave Spain and has vowed to continue with secession, despite Madrid’s insistence it won’t happen. The confrontation has raised fears among investors of unrest in Catalonia, which accounts for a fifth of the Spanish economy. A former principality, the region has its own language and culture and has long complained that it pays more to Madrid in taxes than it receives each year from central funding. The crisis in the euro zone’s fourth-biggest economy has hurt Spanish bond and stock markets. The nation’s borrowing costs hit a seven-month high on Thursday ahead of a government bond auction that will test investor confidence. Prime Minister Mariano Rajoy has offered to open multi-party talks that could cut a better tax and constitutional deal for Catalonia in return for the region giving up on independence. But his government has said the region must “return to the path of law” before negotiations can go ahead. Sunday’s crackdown by Spanish police, Rajoy’s hardline stance and an uncharacteristically strong intervention this week by Spain’s King Felipe VI seems to have deepened Catalonia’s resolve to continue with the project. Opinion polls conducted before the vote suggested a minority of around 40 percent of residents in Catalonia backed independence. But a majority wanted a referendum to be held, and the violent police crackdown angered Catalans across the divide. The leader of Catalonia, Carles Puigdemont, said he was not afraid of being arrested for organizing a banned referendum on the region’s independence from Spain, which went ahead on Sunday despite Madrid using force to try to stop people voting.